These versatile, beautifully-made modular stands from Hi Fi Racks are acoustically good and living room-friendly – an ideal combination – and very attractively priced. They work well as a stand in their own right but can be upgraded very successfully with the LeadingEdge platforms, simply placed on the individual shelves. If more height is needed longer legs to space the shelves further apart can be ordered at a low cost. 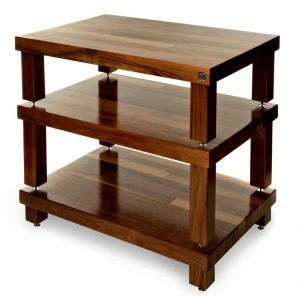 Racks in solid hardwoods: oak, ash, cherry, walnut, maple – leg heights to suit your equipment. The Hi Fi Racks start at about £160 per level and you can specify leg height to suit your equipment at no extra cost, so a four-shelf stand would cost from only £640. Legs can easily be changed to adapt to new equipment. There is a choice of hardwoods, which can affect the price. The LeadingEdge platforms require a slightly wider spacing between the legs, which raises the cost very slightly. There is a large collection of studio and customers’ photographs showing the choices available on Flickr, such as: Two tone rack. We are strongly critical of many so-called “hifi” stands with glass shelves supported on rubber buffers. They can introduce seriously unpleasant colourations and distortions, such as a hard, aggressive top end that sends audiophiles hunting around and wasting money on changing the audio components. How bad is that?! Another of our hates is so-called ‘cable management’, meaning that all cables including mains and interconnects are tightly bundled together. This guarantees that cross-talk and electrical noise will pollute the music signal!! Please don’t let a limitation with a stand dictate how you develop your system – it’s astonishing how often it seems to become a major constraint. Sell it and move on.